Bill Deedes: saints and stinkers - Salut! After I had been lured to Facebook by addicted daughters, I signed up to a section called the "Bill Deedes Memorial Group" in memory of W F - or Lord - Deedes, a valued former colleague and something of a national treasure for readers of the Daily Telegraph. One thing I loved about Bill was that he thought of himself as a reporter. Another was that while, unlike me, he was a Tory, he was at least the one-nation sort. Better still, on the last occasion that we met, in 2005, he told me he wasn't so sure, taking all things (including events at the Telegraph) into account, of even that level of Conservatism. I realise his instinctively Conservative supporters here may find that unpalatable, but if he confided as much in me - a colleague, admirer, occasional drinks companion but not really much more - he will almost certainly have expressed similar thoughts to others. Little did I know just how strongly he had "expressed similar thoughts to others". I do not yet know whether the political doubts are discussed in the new biography, by Stephen Robinson, which can be bought for a proper price here. But he evidently had plenty to say to Robinson about one of the causes of those doubts. My copy of the book is on its way to the Gulf, but if I say Bill used such words as "stinking mob" to describe the new regime at the Telegraph, you will get the picture. The meeting with Bill to which I refer was at the Gare du Nord in Paris. He had arrived on the Eurostar in the company of my then colleague Sue Ryan, truly an angel to Bill in his final years and now my colleague again, and the photographer Abbie Trayler-Smith, who kindly approved my use of her wonderful picture of him taking that journey (I posted other examples of Abbie's work at an earlier item headlined Great words, greater Deedes). Bill's mission, at the age of 92? 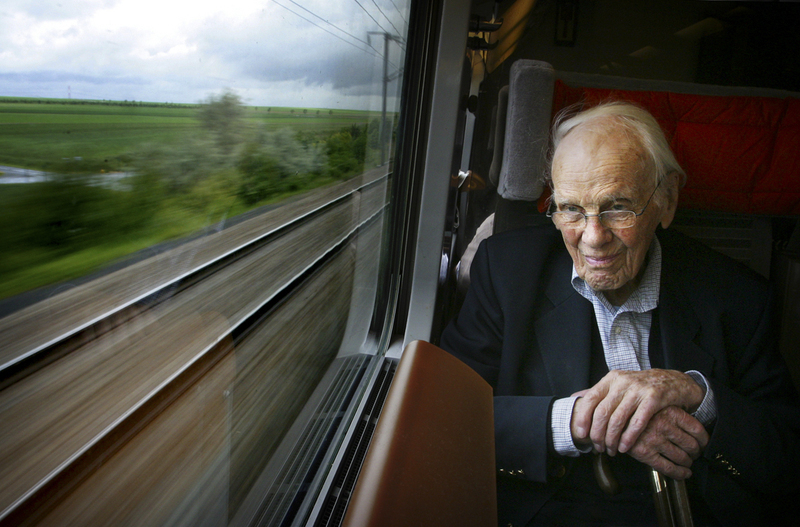 To retrace his own steps as an Army officer from the 1944 Normandy landings to Hannover. My mission, as a mere slip of a fiftysomething lad? To find a decent place for some grub before he was whisked off on his odyssey. Over the road from the Gare du Nord, as I may well have mentioned before, is an exceptionally good brasserie, the Terminus Nord. That was where I had booked, not only because it was so handy but because it was the sort of place that I would take my wife or visiting friends for dinner. Great seafood, dependable staples of French cuisine, highly professional service. For all that Bill was intent on retracing wartime steps, he was actually in a wheelchair when I caught sight of him being pushed along the platform by his ladies. When they went off to collect the keys for a hired car, I wheeled Bill across the road. But he insisted on standing up and walking the last few steps once we reached the other side. And it was at our table, as we sipped white wine - though in London, he'd always preferred beer - while waiting for Sue and Abbie to re-appear, that Bill began to talk about his discontent. It was a private conversation and I treated it as such while he was living. On his death, I said at Salut! that he had been "indiscreet", and I added that comment to the group at Facebook. In a memo passed to Robinson with instructions for disclosure only after his funeral, Deedes describes how he and colleagues came "to doubt whether the Telegraph and the Barclays were compatible". The journalist writes witheringly of the Barclays' swingeing staff cuts, recruitment of executives from the Daily Mail and perceived drift downmarket. "This was a newspaper they were ready to pay £660m for but it was being produced by an unsatisfactory staff," he noted, with measured sarcasm. "Not a word of encouragement or praise came the way of the journalists who produced this high-value newspaper, though reason suggests they must have had something to do with what the Barclays had paid." Over our apéritifs at the Terminus Nord, Bill had seemed genuinely sad as he talked about the New Order. He stuck with the Telegraph - more accurately, perhaps, stuck with the Telegraph readers - though I believe its treatment of Sue Ryan, the managing editor who had worked so hard to ensure his comfort as the world's oldest working journalist, came very close to being the last straw for him. Indeed, the Media Guardian's writer on the press Roy Greenslade takes the view, which I know certain others to share, that Bill's collaboration with people whose actions and attitudes he professed to deplore amounted to cowardice. Robinson's revelations will cause no sleep to be lost by the people now in charge of things at the Telegraph. There is after all a touch of the Millwall FC supporters' ethos about them: "You all hate us, we don't care". It may be just as well all the same that they chose, before Bill's unflattering thoughts about them were aired, to publish a long extract describing his close and (though innocent) obsessive friendship with a very young and attractive female reporter, and his neglect of his own family. What a marvellous stroke of luck that just before he pointed an accusing finger from the grave, W F Deedes should appear in a less than saintly light. * My interest to declare, though most Salut! readers need no reminder of it, is best explained by reference to an article I wrote for my friend and web guru Craig McGinty's site. I call it Life After the Sack and it deals with the period when I was freelancing in the south of France before rejoining my former editor Martin Newland in Abu Dhabi.